As police searched for the shooter or shooters, they took three people in for questioning from a house near Tiffin Avenue, which is where some witnesses said the shots had come from. No arrests had been made by mid afternoon. St. Louis County Chief Jon Belmar told reporters at a briefing around 2:30 a.m. outside Barnes-Jewish Hospital that at least three shots were fired from behind a group of protesters. Both officers were conscious, but seriously injured. They were later released from the hospital. A Webster Groves officer was shot in the face and a St. Louis County officer was shot in the shoulder. Although the names of the officers were not given out at the briefing, reporters were told that the county officer is 41-years-old and a 14-year veteran of law enforcement. The Webster Groves officer is 32 and has been with the department for seven years. Screen shot of the scene an hour or so after shots were fired in Ferguson Thursday morning. 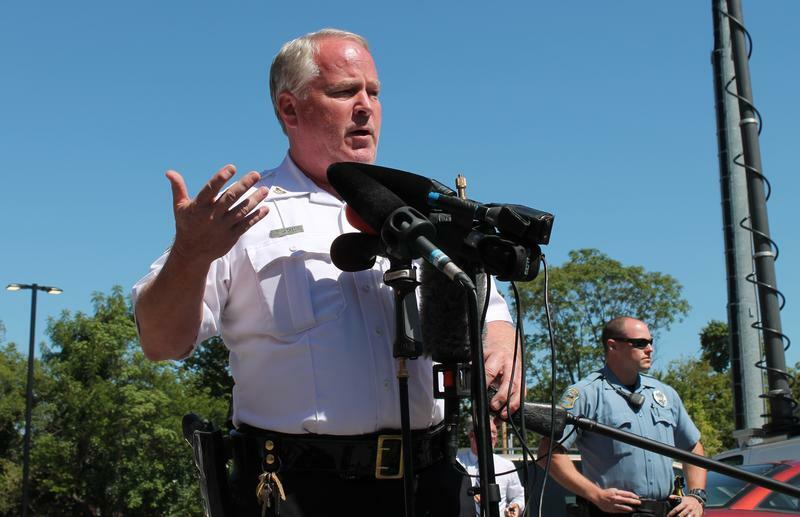 Thursday morning Belmar and St. Louis County Executive Steve Stenger held a press conference in which Belmar said that both of the officers' injuries were not long term. "We're lucky, by God's grace, we didn't lose two officers last night," Belmar said. During the press conference, the St. Louis County Police department also released evidence photos on their Facebook and Twitter accounts. Belmar said that investigating who was responsible for the shootings was currently the department's number one priority. "The responsibility of last night's shooting lies with whoever did the shooting." Based on shell casings found on the scene, Belmar says that the weapon used in the shootings is believed to be a handgun. One of the evidence photographs released by the St. Louis County Police Department. 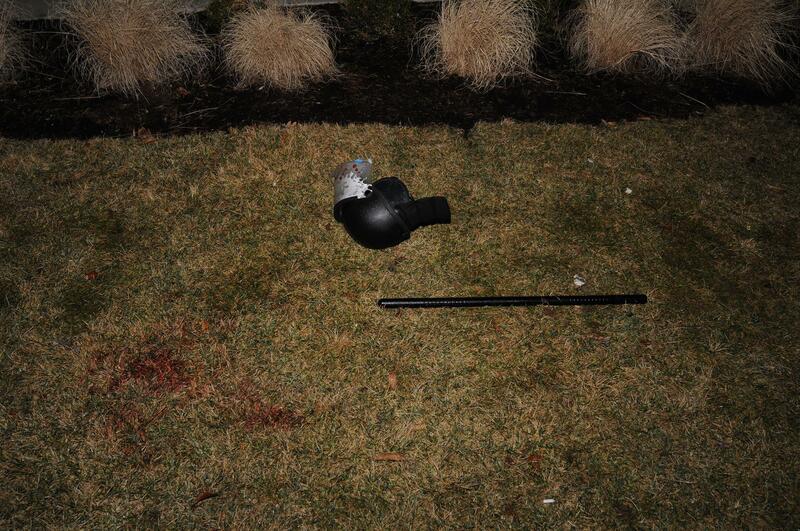 Pictures taken by the St. Louis County Police Crime scene unit. Stenger said that at the time of the press conference he had not yet spoken to Ferguson Mayor James Knowles, but planned to later Thursday morning. Stenger said he didn't consider the shootings "a setback toward healing." 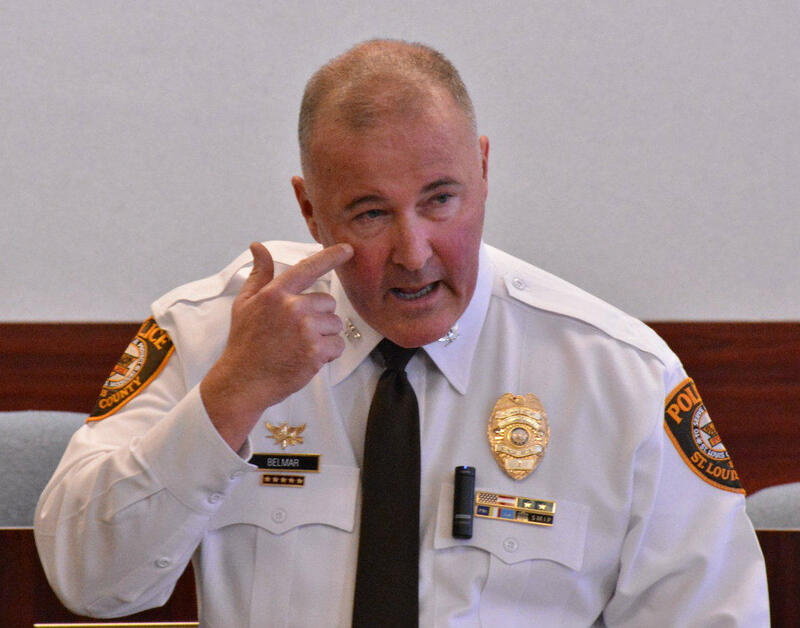 Belmar said until the shots were fired, the night had been relatively uneventful, though on Thursday he mentioned reports that the crowd was not entirely calm. The crowd peaked about 60 to 70 people, and Belmar said many of the police and protesters had started to disperse when shots rang out. Belmar said he believed the officers were shot simply because they were police, and added that it's fortunate no other officers have been hurt over months of protest. "This is a very, very dangerous environment for the officers to work in up there regarding the amount of gunfire we have experienced," he said. The St. Louis County Police Department said Thursday morning that commanders are currently in meetings talking about a plan regarding changes in policing future protests. 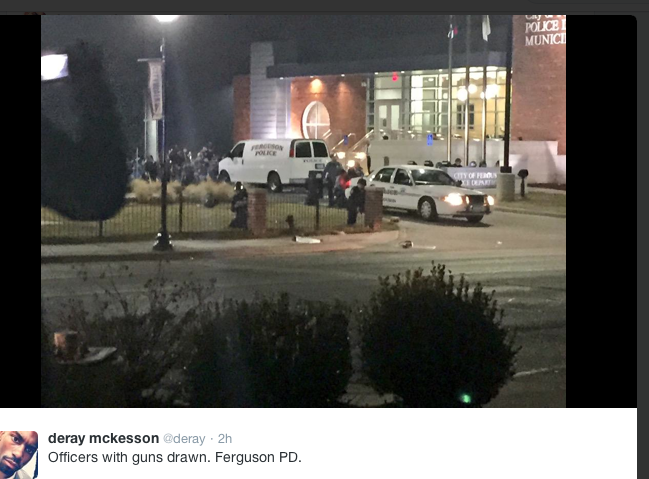 Wednesday evening began with a familiar scene outside the Ferguson Police Department. More than 50 protesters gathered and chanted after Ferguson Police Chief Thomas Jackson resigned earlier in the day. Many were calling for the resignation of Ferguson Mayor James Knowles, who had said he would not resign at a news media briefing earlier that evening. At one point protesters blocked traffic. Some protesters commented that it felt like August. The shots came just after midnight as people were starting to leave. Belmar said he believed the shooters were embedded in the group that remained, a point fiercely disputed by protesters on the scene. The Very Rev. Mike Kinman, the dean at Christ Church Cathedral, said he had arrived at the protest site shortly before the shooting occurred. He said he was standing in the parking lot of Andy Wurm Tire and Wheel Company directly across from the police department, and the shots came from further up the hill. "I was facing the police department, and the sounds came from my back and to the left," he said. "It was up that streets, up that hill where the shots came from." The protesters have been making to much change for the last 215 days hints DOJ report.... shooting a officer isn't worth our time. Ferguson Democratic Committeewoman Patricia Bynes saw reports of the shootings on Twitter while returning from the St. Louis Downtown Post Office, and immediately rushed to the scene. 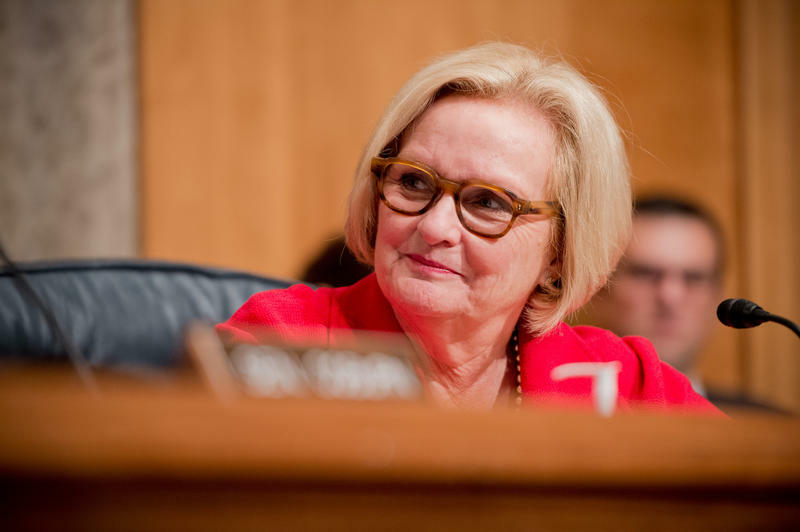 "I knew immediately that I needed to come down here," she told St. Louis Public Radio. When she arrived she found the street taped off by police with few protesters and media remaining. Shortly after 2:30, she tweeted that police were focusing their investigation at the top of the hill on Tiffin; "that is far behind the protesters." Jon Belmar, the county chief, said the department will be re-evaluating how it deals with protesters. "Obviously my first priority is to the community, but that’s followed very closely to my police officers, and making sure that they’re able to do what they’re supposed to do out there in a safe manner," he said. Kinman, the Christ Church leader, called the introduction of violence to what has been a fundamentally peaceful movement, "terrible." "It's awful," he said. "It has the potential to derail everything that we're working for. And it also puts people in a place of fear. When violence enters in, people get afraid, and we don't act as our best selves." 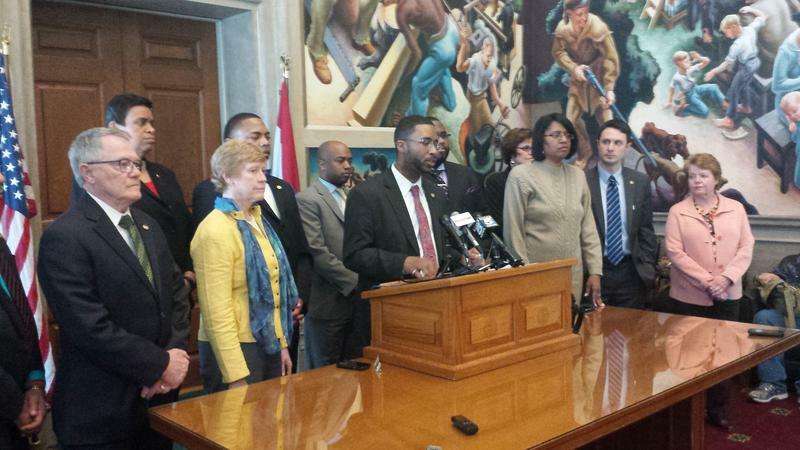 The Missouri Legislative Black Caucus is growing impatient with the House’s inaction on Ferguson-related bills. In a news conference Wednesday, state Rep. Brandon Ellington, D-Kansas City, and about 12 others accused Republican leaders, including Speaker of the House John Diehl, R-Town and Country, of stalling progress on bills addressing law enforcement practices. Many of these bills were introduced in reaction to the shooting death of Michael Brown by then-Ferguson police officer Darren Wilson.